If you have "special needs", attention to detail and critical pre-planning are the keys to wonderful trips. 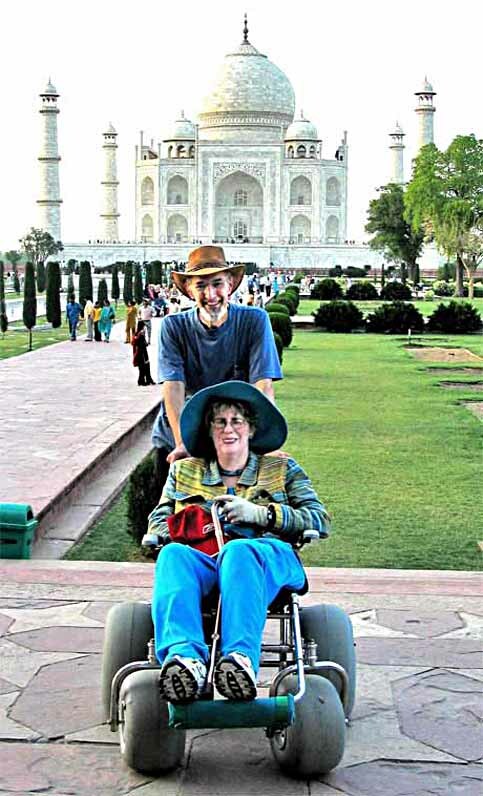 Nancy and Nate Berger at the Taj Mahal, Agra, India. First, start with a dream. Then, plan to make your dream come true. We would not have succeeded without their efforts. They took care of details we would never have known to consider. And they did not charge us anything for all their work. Why would they do all this for perfect strangers? It is because there is an abundance of human kindness and compassion in the world. Everyone admires you for trying. Your success becomes a personal quest for them, and they will not disappoint you. Get rid of your fears, trust the solution will be found, and everything else becomes achievable. If you do this, then you have the potential to live and enjoy exciting things you would never have imagined! As you can see in the photo below, our dream came true. 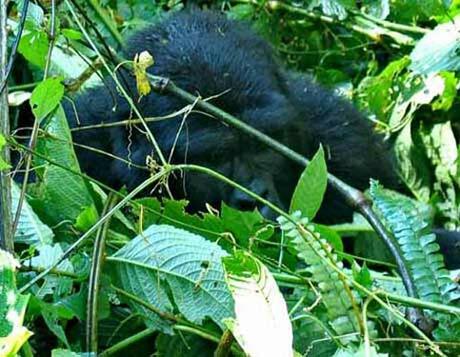 I was standing just a few feet away from this huge Silverback gorilla. The picture is not taken with a zoom lens- he could have reached out and punched me straight into the ground if he had wanted to. Nothing replaces real life, real time. You have to be there to know you have accomplished something extraordinary. To feel the hair on the back of your neck stand on end. To feel the ground actually tremble when this enormous animal starts to move. Watching a video on TV is nothing in comparison! Every one of us with physical limitations is afraid we will make the wrong decisions in unfamiliar situations. Planning helps prevent such things. We worry we will embarrass ourselves or be too much trouble for others around us. The truth is just the opposite: Each and every person you meet along the way in your travels appreciates in his or her own way what it takes for you to be in their world. They want you to succeed and will do all they can to see that you do. If you believe- truly believe- you can do a thing, the power to do it somehow comes as you are doing it. Deal with reality. Nancy needs help bathing, dressing, toiletting, transferring and eating. She must use a wheelchair every place we go. If we can do these things, you can, too. If you really want to travel, you can turn your dreams into reality by planning properly. Determine your overall budget before you start to plan. Be realistic. You will be sorry if you don't get this right at the beginning. Decide as exactly as you can where you want to go. Make a list of places, then narrow it down by prioritizing. Are there specific things you dream of seeing? The Great Wall of China? Sunrise over Ayers Rock? Write these dreams down in order of their interest to you. Carefully list out what you can and cannot do physically. Anyone who helps you will need to know if you cannot walk far or climb stairs. What else? Remember: Being out of your usual environment, having to adjust to new circumstances is quite fatiguing just by itself. Avoid over planning your activities. Don't over estimate your stamina. Decide will you stay just in the cities- or will you be traveling to small villages? Costs, services, availability of supplies vary widely. Where will you sleep? One star hotels or a pensione with a common bathroom at the end of a dimly lit hallway may not work for you. Take with you what you can. Renting scooters or walkers, buying disposable paper goods, replacing medicines- much of this is not possible other than in larger Westernized cities. There is little to no opportunity if you need technical services or parts. It is nearly impossible to rent heavy equipment, such as hoists or lift-equipped vans. Read and use the information you will find in How to Plan a Trip and the chapters that follow it. 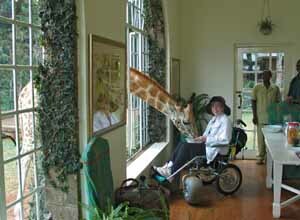 If you want to learn more about Nancy and how we handled her disability, click here. To get into a village in the Hill Country of Northern Thailand, we had to cross a small creek. 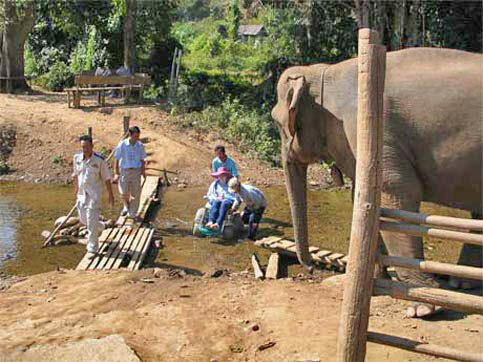 As you can see, it would be Impossible to take a wheelchair over the narrow, makeshift bridge. 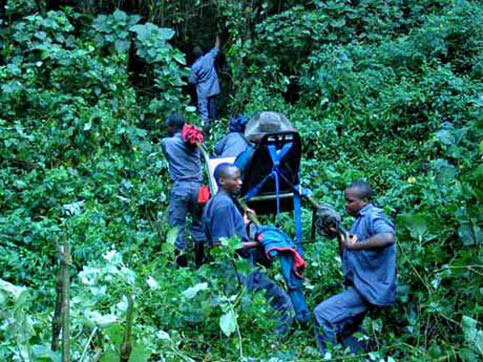 An old elephant watched as a couple of the tribesmen voluntarily came over, lifted the wheelchair, and carried Nan across. They would not take any money for their service. In their belief system, they are blessed if they help a stranger in need. Speaking through our guide/interpreter, they thanked us for letting them earn a blessing, and they praised us for our courage. They told us they were honored we should come so far from our home and country to be with them. To get to the Polar bears in the Canadian Arctic, we would have to fly in a small, four seater float plane because there are no roads in that part of the World. How could we get Nancy- who cannot walk- into this little aircraft? It was easy- once the pilot figured out the solution: "We need to remove one of the seats first", he said. It took an extra half hour, but he was totally pleased when the deed was accomplished. He asked me for a copy of this photo so he could show all his friends. "I admire you- you guys really have guts", he told us. Yes, we do- if that's what it takes. Wouldn't it be a shame for you to miss experiences because you think you can't do it - or it will be too hard? People everywhere have helped us get to every place on this site. They will help you. We will help you. 1) Perhaps you could go to China and view the world from atop the Great Wall. Getting on it is an adventure in itself- Hundreds of tourists, already on the Wall, their camera flash bulbs popping, video equipment recording, watched as our guide, driver, two Red Army officers and their rifles helped us achieve this travel dream. Read how we did it here. 2) You could get a super fresh meal even though there is not McDonalds within hundreds of miles. We spent several days tracking, then watching this daughter and her dad devour their kill while we were on safari in South Africa. 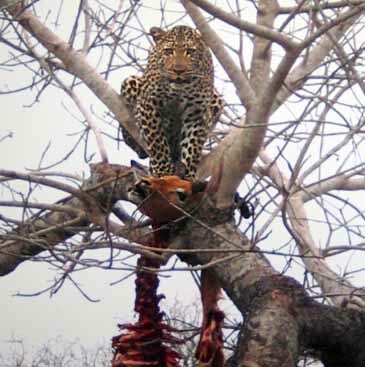 Suggestion: If you plan to join them for lunch or dinner, make sure leopards are in a good mood first. Also, don't complain there isn't much left (at least not to the leopards). 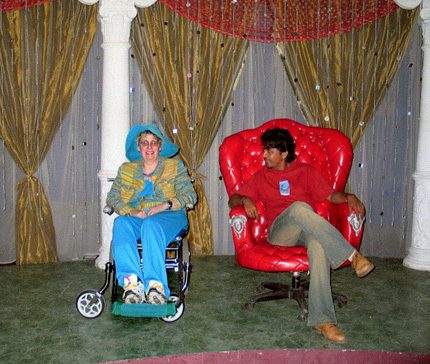 3) Maybe you would like to become a movie star and make a film with a handsome director in famous Bollywood, India. We visited several studios, even took part in a TV soap opera. "Make Believe" is great fun. Living it is even better! 4) Ever think about sharing breakfast with an unexpected guest: While on photo safari in Kenya, Nancy was having a glass of orange juice when this brash young fellow stuck his head in and "asked" her for some. 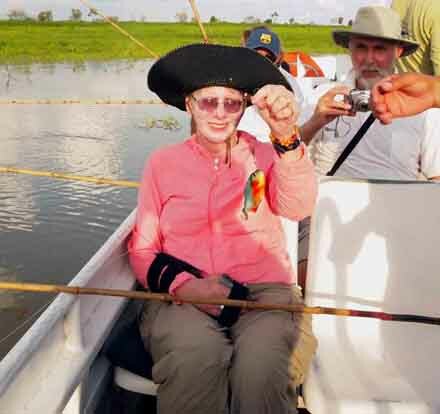 5) Nancy was really thrilled when she caught this colorful piranha while fishing on the The Amazon River in Brazil. All of us in the boat were amazed when one of the guides jumped into the water to swim, showing us piranha do not eat people - except under extreme circumstances. He asked everyone to join him in the water. No one did. Look what you can do! If we can get to all these places, you can, too. Live your own dreams. To help you plan better, here are ten very special Travel Tips. With these, you can guarantee any trip you plan will be a success! Concerned about taking medicines or special needs equipment? There are special ways to insure your medicines and adaptive equipment are not seized at customs. Don't try to slip anything by inspectors. 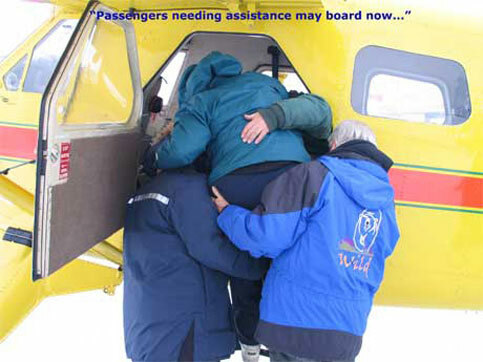 Read airlines and learn how to avoid hassles- whether you are going to fly or not. Planning for a cruise? Here are the critical things you need to do to make make the right cruise choices. Read this even if you are not planning to board ship. Need a hotel? If you are a disabled traveler, if you have special needs, click here (hotels) to learn how to get what you need- not just the first room that comes up on the computer. Have to get organized? The place to start is with a good check list. We have included ours- it is a sure winner! 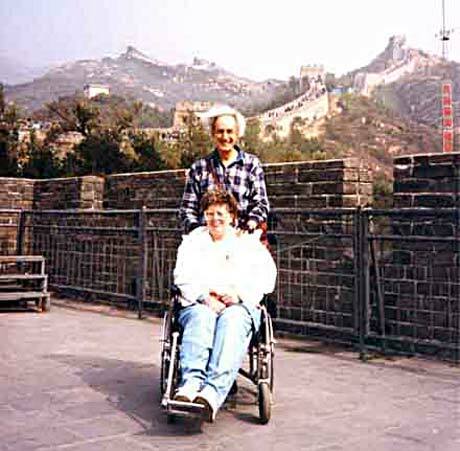 -OR- Click here to download the entire "Disabled Travelers Guide". It is free. No registration necessary. "After my strokes, there were days I lay in bed wondering, "Am I ever going to be able to do anything meaningful or fun with my life again?" "Later, while we were in the Antarctic", she says, "I figured out the purpose: 'So I could encourage and give hope to anyone else as overwhelmed by physical limitations as I was. People need to know if we can do these things, they can, too.'" Nancy and I feel blessed to share what we have learned with you. It honors the Human Spirit, and, simply put, it's just the right thing to do. Best wishes and Live Your Dreams. Remember, we are a disabled couple, in a wheelchair, with lots of "special needs" If we can travel the world, you can, too. Ask us. We'll help. Please feel free to contact us if you have questions, suggestions, comments or just some friend words by clicking on our contact form.